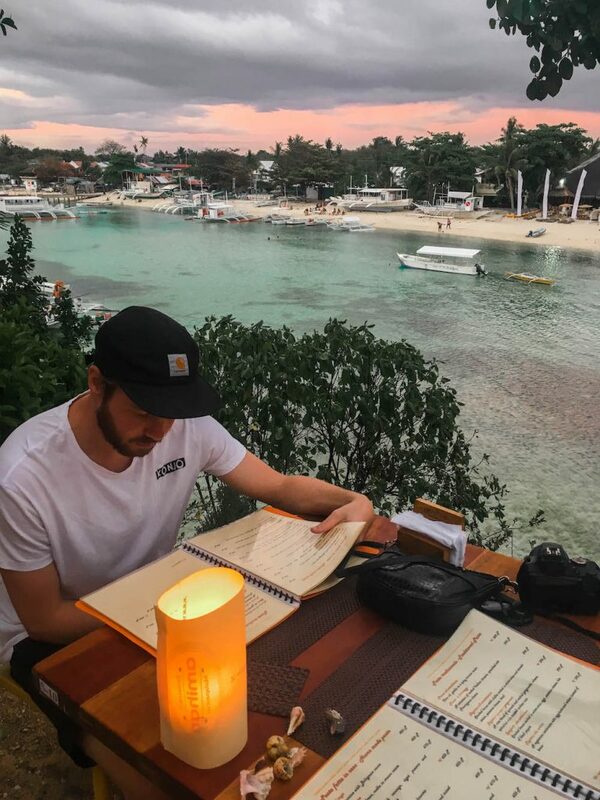 We stayed in Malapascua for one week and during that time we tried a lot of different restaurants: local, vegan, vegetarian, thai, Italian… So, are you not sure where to eat in Malapascua? 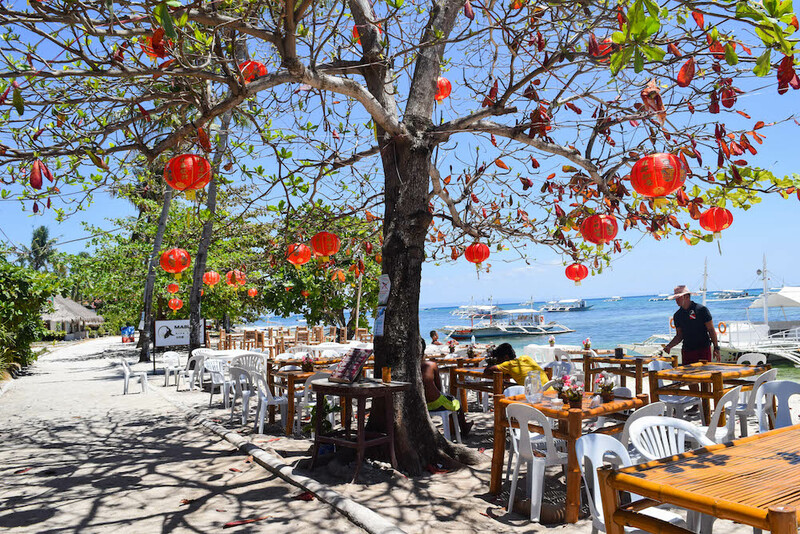 In this article I share 6 restaurants in Malapascua that are worth a visit. Especially the first three restaurants in this list serve great food, which is why we visited those more than once. 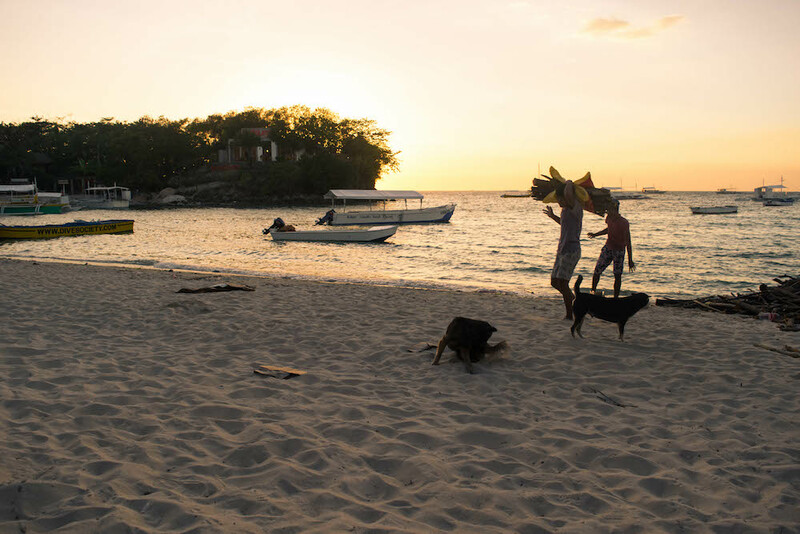 Malapascua isn’t necessarily a destination that you visit because of the food. It’s a real divers’ paradise because of the beautiful marine life. But I actually started writing this food guide during our fifth day here, as I realised that we tried so many different restaurants. 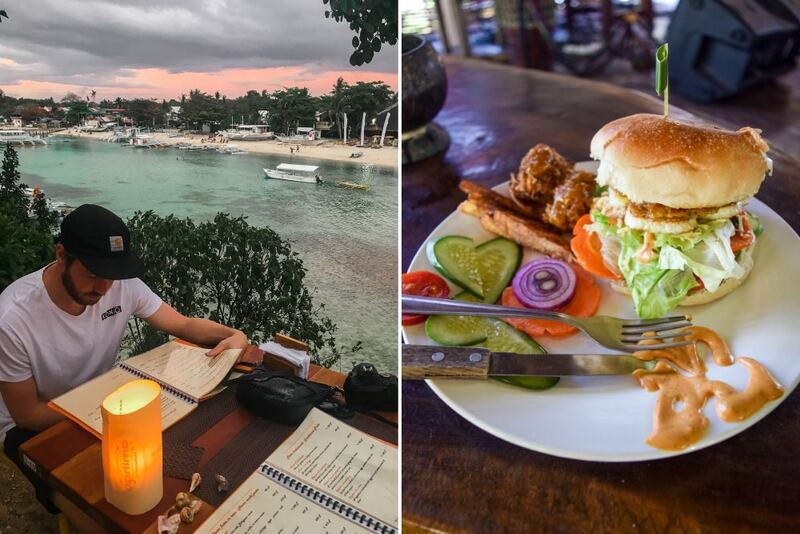 Even though Malapascua isn’t really a culinary island, I consider food to be a very important part of my trips and I know a lot of people feel the same way! 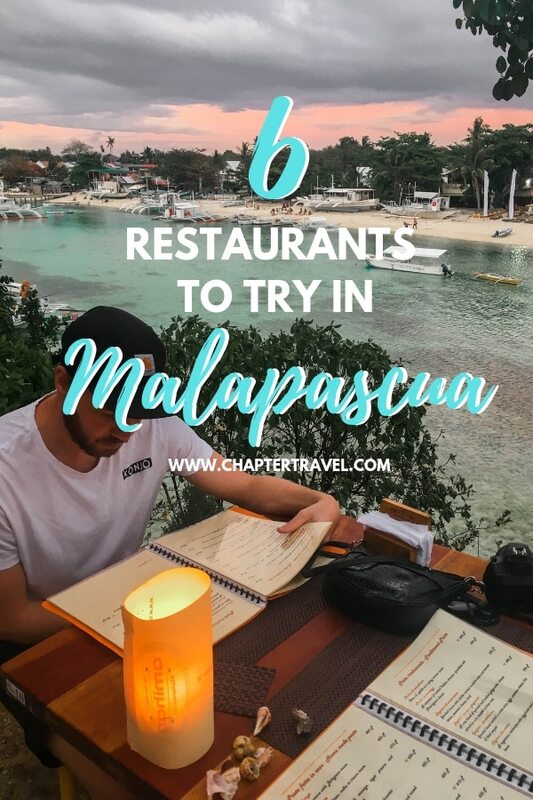 For those that do, I decided to share this list with 6 restaurants in Malapascua that are worth a visit! 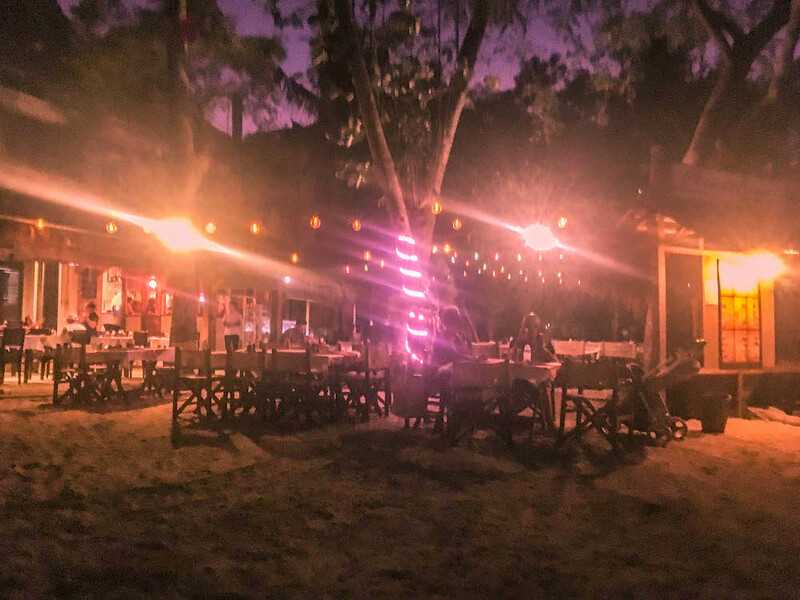 It’s not a surprise that Amihan is number one on TripAdvisor (at least at the time of writing this article), because this restaurant really is a must-visit in Malapascua. There are three simple reasons why you should eat here in Malapascua. One, there is a lot of choice in food and the quality is good. Two, Amihan offers a beautiful view over the beach. And three, the service is fast and friendly! The first time we visited Amihan we arrived during sunset and ordered an Espresso Martini and an iced coffee. The iced coffee wasn’t on the menu, but they didn’t hesitate to make it anyway. After enjoying the beautiful view of the sky that was slowly darkening, we ordered food as well. We ordered the vegetarian bruschetta as an appetiser, which was surprisingly good (until then we weren’t as lucky when we ordered something with bread in the Philippines). 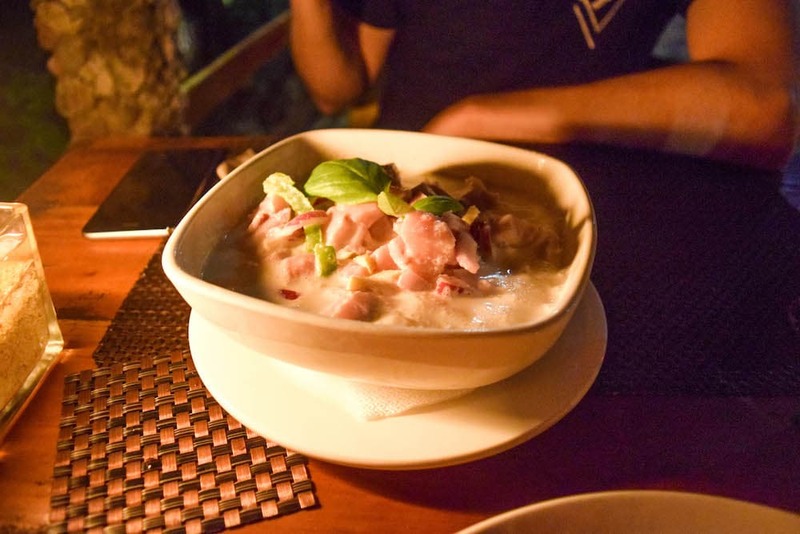 My boyfriend Jeffrey had the Kinilaw (literally means ‘eaten raw’) as a main course, which is a traditional Filipino dish of raw fish in a fresh, creamy curry. The dish is very similar to ceviche. We tried it several times in the Philippines and really loved it! I ordered the fish ravioli with “pink sauce” (a creamy tomato sauce), which was on the specials board. Both dishes were tasty! We were too full for dessert the first time we went, but we returned at Amihan twice during our time in Malapascua and also tried the Mango Float dessert. A Mango Float is a traditional Filipino dessert made of lady fingers, condensed milk and mango. It’s actually very similar to Tiramisu, but sweeter! 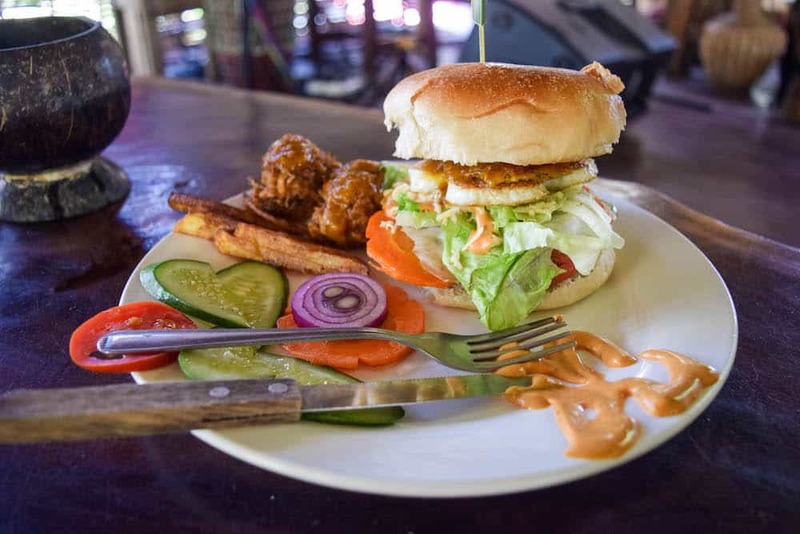 Villa Sandra’s Guesthouse isn’t only a place to sleep, it’s also a place to eat! At this guesthouse you can find an excellent vegan/vegetarian restaurant. I really recommend going here, even if you’re not vegan or a vegetarian. If you’ve had enough of the sun and the beach, it’s the perfect place to order lunch, read a book or even take a nap. Next a seating area consisting out of benches and tables, there is a elevated space where there are pillows everywhere. 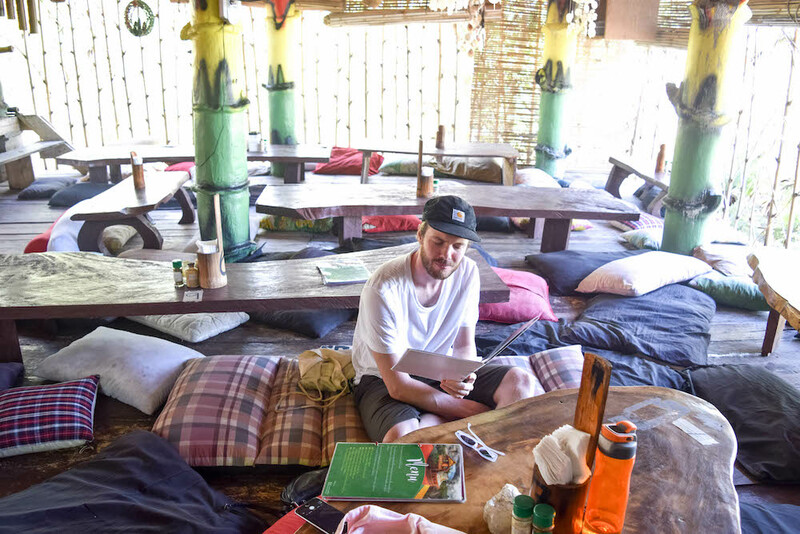 Because of all the cushions on the floor and the red, yellow and green details, there is a real backpackers and reggae vibe. There are signs put up all over the place with texts such as “Dream high as the sky” or “Honesty is the best policy”. Furthermore, there is a lot of handmade art (made of plastic bottles) and other quirky items hanging from the ceiling. On the building itself you can find a lot of colourful paintings. We went to Villa Sandra’s for lunch twice. We tried the Overload Burger Buns (you can choose the vegan or vegetarian version) with buns, cucumber, eggplant, carrot, cabbage, mushrooms, onion, bell pepper and served with a bit of fries and mini crunchy balls. I know, crunchy balls sound really weird, but they’re so good! They’re basically fried vegetables. The service here is as you expect it to be: mellow, a bit slow and well, uninterested, but friendly enough. Of course you can also go to Villa Sandra’s Guesthouse for dinner, but we haven’t tried it ourselves. But basically the menu is the same. I’ve read that they often do live performances so that could be interesting. I didn’t bring my camera this night, so apologies for the blurry phone shot! If you’re craving pizza, you should definitely go to Ristorante Angelina. It’s located right on the beach, next to Amihan. It’s a nice little Italian restaurant with a romantic vibe due to the string lights and typical Italian table settings. Next to pizza’s, they serve pasta’s, various other Italian dishes and even gelato. The first night on Malapascua we really craved Italian food. We found quite good reviews on TripAdvisor about Ristorante Angelina, so we gave it a shot. Jeffrey and I both ordered a pizza; I had the quatro formaggi and Jeffrey had the Prosciutto gorgonzola pizza. We were both pleasantly surprised with our pizza. The crust was thin and crunchy and the toppings tasted very fresh. Afterwards we also ordered dessert. Especially my crème brule (it was named differently on the menu) was very tasty. Another night we also decided to go here and I ordered the pasta with tuna. This wasn’t as good as the pizza, so I wouldn’t recommend ordering a pasta. The service here was fine, but sometimes I had to catch their attention to order something. Overall, Ristorante Angelina is a must if you are in the mood for pizza. 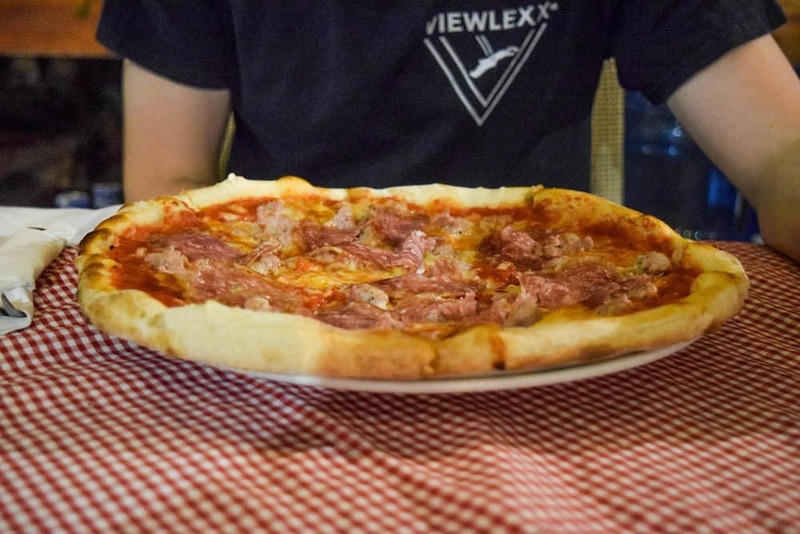 It’s really surprisingly tasty, especially if you consider that you’re eating a pizza in Asia, not Europe. 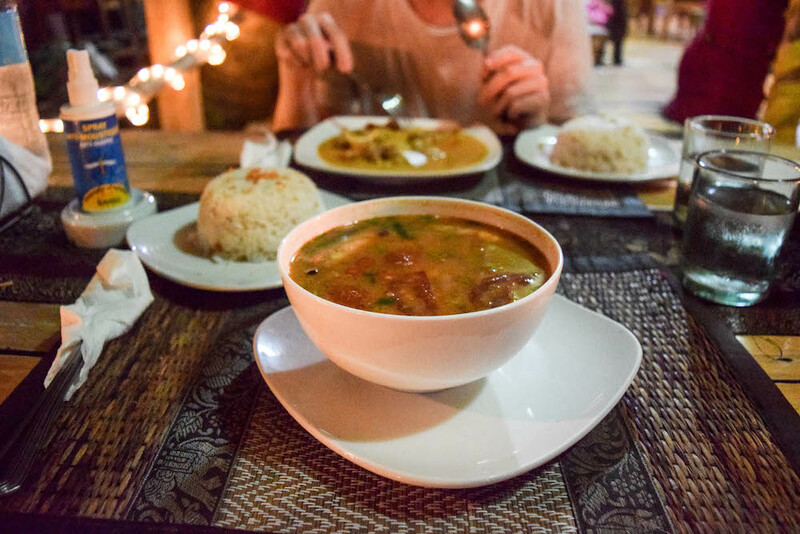 Yes, we even tried Thai food during our time in Malapascua. Why not! 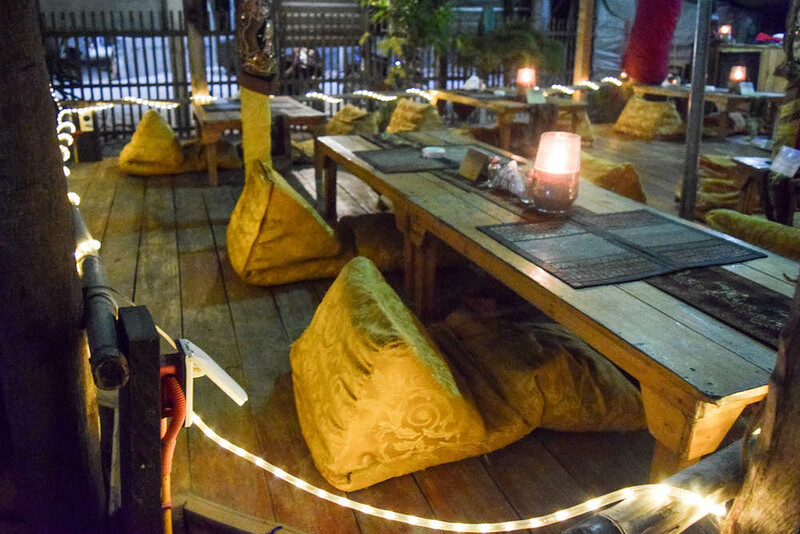 The atmosphere of Aroi Mak is relaxed, with cushions on the floors (the ones you can typically find on a lot of Thai Islands) and string lights across the restaurant. The menu is extensive too, with plenty of choices, but not too much that you’re unsure what to order. Aroi Mak is also one of the cheapest restaurants we encountered on Malapascua. To be honest, I was really surprised that it was so quiet here. Eventually we were even the only two guests in the restaurant. Perhaps not many people feel like eating Thai food when they are on this island, or they don’t like spicy food. Not only was the setting of the restaurant lovely, the food was good too. I ordered the Spicy prawn soup and Jef had a yellow curry. It was quite spicy, but the right amount of spicy for my liking. The staff was quick, but they looked quite unhappy and I even felt a bit sorry for them. Perhaps they were bored because it was so quiet the night we were there? Anyhow, usually when I see an empty restaurant I consider it to be a bad sign and rather look for something a bit more crowded, but this time I was happy we still gave it a chance. At Kokay’s in Malapascua they have a lot of options on the menu, from fish and meat dishes, paella, Thai, Filipino, Mexican to Italian. Whenever I’m at a restaurant and there are these many options, I know that the food can’t be that good. The chef must prepare all these different kinds of dishes, so there will be little room for perfection. The setting of the restaurant is nice, also a good place to watch the sunset with a cocktail. That is how we noticed this restaurant; we were looking for a nice place to watch the sunset. A day later we decided to give it a try and eat there ourselves. First of all, we got a complimentary basket of bread and sort of bruschetta spread. Quite tasty and a nice touch. Most of the times when we see nachos on the menu, we go for the nachos. That’s why we decided to take it as an appetiser to share. The portion is very generous, so when the main course arrived we were already very full (and we can both eat a lot). 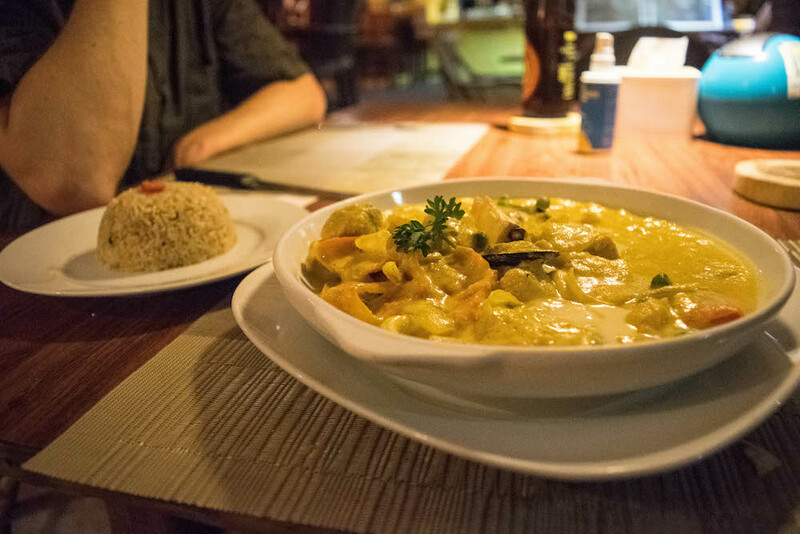 I chose the Thai seafood curry and Jef ordered the Quatro Formaggio pizza – isn’t it quite funny this is possible at the same restaurant? Both weren’t that great, but good enough. My seafood curry could have been a little more diverse in seafood (it contained a lot of calamaris, something I don’t really like). The Quatro Formaggio pizza only had three cheese toppings and at the same time had other toppings that usually aren’t on a Quattro Formaggio (as far as I’m aware), such as olives. Then why is this restaurant in this food guide? What Kokay’s particularly excelled in was the friendly service. Perhaps we were lucky with our waitress, but for the first time in Malapascua we were served with a big smile at all times. Furthermore, the location of the restaurant is nice, the nachos were good and the main dishes were good enough. Mabuhay Bar and Restaurant was the first place I noticed when we got off the boat on Malapascua. It’s on Bounty Beach under a tree full of lanterns. As our resort was close to this place, we often walked past it and every night it was really busy. It was probably always packed because of the cute setting with all the burning lanterns. When I looked up this place on TripAdvisor, the reviews were a bit mixed, with both positive and negative reviews. We decided to try it out for lunch one time. When we were there it was super quiet and the waiter came immediately. The mango shakes we ordered were fresh and tasty. Our lunch consisted out of fried chicken for Jeffrey and fried shrimp for myself. To be honest, it wasn’t anything special, as you can see from the photo above. Definitely nothing wrong with the dish, but how can you go wrong with fried food? I would say, give it a try one time just for the lovely setting on the beach, whether it’s for lunch, drinks or dinner. Every night they offer fresh fish, so that might be a good reason to visit as well. 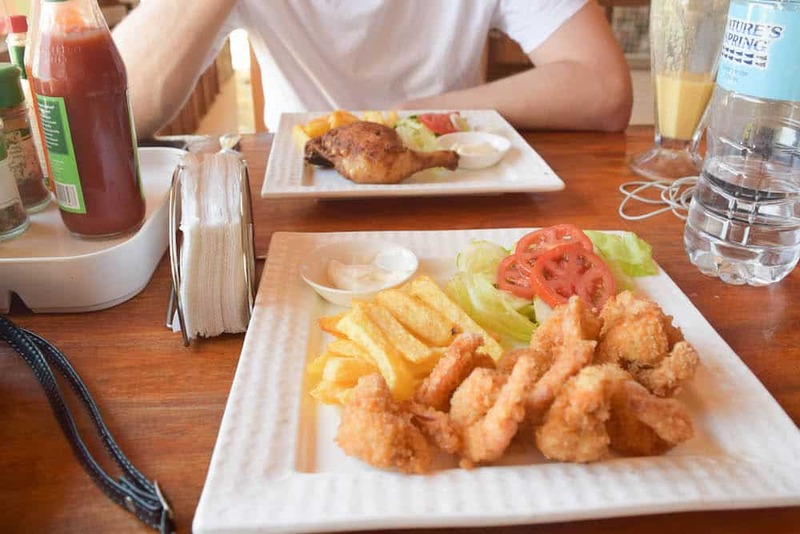 I hope this guide helps you find the right restaurant for your stay in Malapascua! Let me know in the comments if you have any questions or comments. Please be aware that my visit to a restaurant is just a snapshot. It may be that your experience to one of these restaurants is completely different from mine, whether in a positive or negative way. Of course I hope for the first!